(Nanowerk News) Increasingly small robots that carry out their functions even inside the human body. No, this isn’t a sci-fi dream but a close possibility. On one condition: the miniaturization of these devices requires them to acquire the same “softness” and flexibility as biological tissues. This is the opinion of scientists like Antonio De Simone, from SISSA (the International School for Advanced Studies of Trieste) and Marino Arroyo from the Polytechnic University of Catalonia, who have just published a paper in the Journal of the Mechanics and Physics of Solids: taking inspiration from unicellular water micro-organisms, they studied the locomotion mechanisms of “soft robots ”. Forget cogwheels, pistons and levers: miniaturized robots of the future will be “soft”. “If I think of the robots of tomorrow, what comes to mind are the tentacles of an octopus or the trunk of an elephant rather than the mechanical arm of a crane or the inner workings of a watch. And if I think of micro-robots then I think of unicellular organisms moving in water. The robots of the future will be increasingly like biological organisms” explains Antonio De Simone who, together with Marino Arroyo of the Polytechnic University of Catalonia, has just published a study in the Journal of the Mechanics and Physics of Solids ("Shape control of active surfaces inspired by the movement of euglenids"). De Simone and his team at SISSA have been studying the movement of euglenids, unicellular aquatic animals, for several years. One of the aims of De Simone’s research – which has recently been awarded a European Research Council Advanced Grant of 1,300,000 euro – is to transfer the knowledge acquired in euglenids to micro-robotics, a field that represents a promising challenge for the future. Micro-robots may in fact carry out a number of important functions, for example for human health, by delivering drugs directly to where they are needed, re-opening occluded blood vessels, or helping to close wounds, to name just a few. To do this, these tiny robots will have to be able to move around efficiently. “Imagine trying to miniaturize a device made up of levers and cogwheels: you can’t go below a certain minimal size. Instead, by mimicking biological systems we can go all the way down to cell size, and this is exactly the direction research is taking. We, in particular, are working on movement and studying how certain unicellular organisms with highly efficient locomotion move”. 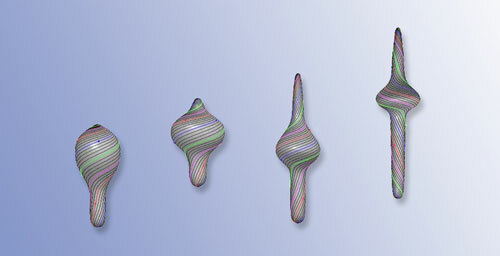 In their study, De Simone and Arroyo simulated euglenid species with different shapes and locomotion methods, based chiefly on cell body deformation and swelling, to describe in detail the mechanics and characteristics of the movement obtained. “Our work not only helps to understand the movement mechanism of these unicellular organisms, but it provides a knowledge base to plan the locomotion system of future micro-robots”.